To make this designer bag birthday cake, I began with a 24 cm square carrot cake which I cut into 4 strips of decreasing size: 10 cm , 8 cm , 4 cm, and 2 cm. I then spread a layer of buttercream icing over the largest piece which would be the base and then added on the next largest piece and so on until I had a rough triangle. I inserted two skewers, one on each side, from top to bottom to hold the 4 layers together. I then trimmed the sides to get a smooth surface. This formed the body of the bag. 500 g of fondant in a dusky pink color. I rolled this out and cut out pieces to fit the front, back and sides of the cake - two triangles for the sides, and two rectangles for the front and back. I pressed a piece of crushed, rolled-up aluminium foil over each piece to create the texture of leather. 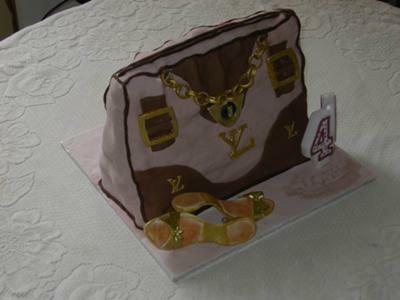 I then covered the entire cake with butter icing and then I covered the cake with the pieces of fondant, creating folds and creases towards the top to make it look like a handbag. I darkened the left over pieces of fondant, and cut them into shapes to form panels which I arranged symmetrically at the corners. I stuck these down with egg white. I used thin strips to disguise the joints in the pieces of fondant. The attachments on the bag were made well in advance. To make the chain I used fondant to which I added a teaspoon of CMC which hardens the paste. I then cut a strip of fondant about 1 cm wide and divided it into a number of lengths, each measuring 4 cm . I then formed a small circle and sealed the ends with egg white. I threaded the next length through the first circle to form the link of the chain. I continued until I had the length I wanted. I allowed this to dry until it was hard and strong. I painted the finished chain with edible gold luster dust with a brush dipped in Vodka This was attached to a piece of fondant and attached to the bag with egg white. The buckles were formed from a square of paste from which two smaller pieces were cut out, leaving what looked like a buckle. These were left to dry and were painted later. Strips of fondant were threaded through the buckles and were stuck onto the bag. The designer's logo bits were cut out of fondant and were stuck on as required wherever there were bare spaces. The cake was made for a friend who celebrated her 40th birthday. The sandals were made from fondant simply by cutting out the shapes for the sole and the upper, and sticking them together.T hey were painted when they were dry. Such perfection in the detail. Great cake. I bet it was equally delicious. Thumbs up from a fellow South African now living in the UK. Return to August 2011 Cake Decorating Contest Submission Form.